So you’ve decided to take the plunge and start a small business. That’s great! Do you have a plan for how you will start? Do you know what you’ll need to have prepared before you ever even open your doors? Knowing how to start a small business is the trick to starting out on the right foot. Luckily, with a little research and planning, you’ll be well on your way to creating a successful small business. Here are a few things you should start with. Write down what your small business is all about and what your plan for the business will be. Put together a good description that defines your business. Start creating a formal business plan. What type of small business will it be? What will the core value proposition be? What problem are you solving or trying to make better? What’s your plan to market it and what analysis have you done on potential competitors? Don’t forget to consider how you will finance your business either. Do you plan to bootstrap, do you have an angel investor, or do you intend to seek out small business loans? There are a lot of questions you must ask yourself before you dive deep into a new business, so make sure you’ve written down a solid plan before proceeding. Register your business with your local government, get an EIN (Employer Identification Number). Choose what business structure will be best for you. Will your business be an LLC, a Sole Proprietorship, a Partnership, or something else? If you’re just starting out and you have no business partner, consider starting as an LLC so creditors can’t come after your personal finances and assets to pay business debt. You will also want to make sure you’ve taken care of acquiring any necessary business licenses or permits that are applicable to your business of choice. While there are some federal ones that every budding small business needs to take care of, there are also certain licenses and permits required by each state. Take time to research the business requirements for your specific state so you can be certain that nothing slips through the cracks. One of the best reasons for getting a business bank account is to fully and 100% separate your personal finances from your business’s finances. You will be especially grateful you did this when tax season comes. 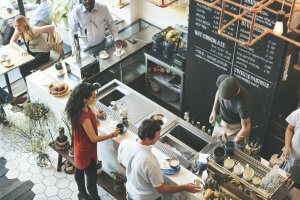 Another reason this is so important is because the moment you use your personal account for any business expense, the liability is no longer limited to just your small business. The moment you blend the two accounts, all of your personal finances and assets are now on the line if you ever have creditors seeking debt collection. Ever heard the phrase, “Location, location, location”? This phrase has been around for nearly a century, and for good reason. The basic meaning is that no matter how great a structure is, if it’s not in the right place, it will dwindle away. You may have found an absolutely perfect building for your small business, but where is it located? Is it in a high traffic area or in the middle of nowhere? Maybe it’s in a high traffic area, but it’s hard to get to or hard to see. Most of us have probably witnessed a particular lot that seems to be “cursed” and cycles through businesses every year or two. Such a lot exists in my town and in the last decade, I have seen 6-8 new businesses attempt to do better than the last, but with no success. Some even had excellent food with great service and had all the indicators of a great business; but it didn’t matter because ultimately, it was a poor choice of location. Without the right location, your business may be doomed before it even begins. Moral of the story: do your research on location first, and then seek out the actual facility for your small business. You can tailor a building to fit your needs, but you can’t change the location or surroundings of the facility that you purchase or rent. The great thing about running your own small business is that you are finally your own boss! But with great power comes great responsibility. The only person you’ll report to is YOU. Being a successful entrepreneur takes hard work and extreme self-discipline. Put together a schedule and stick to it. Put that schedule on a calendar and sync it to all of your devices. Block out daily uninterrupted time for you to get crucial things done. Consider finding a friend or family member to whom you can be accountable. Check up with them every day and let them know your goals and timelines. This is one of the most crucial aspects to start a small business. A great idea will only get you so far. What funding source(s) do you intend to utilize? Do you plan to partner with someone who has enough money and resources to cover the initial investment costs? Will you seek out an investor to get your small business up and running? Or do you like the idea of keeping 100% ownership of the business? Partnerships and investors will usually require a certain percentage of ownership of your small business and if you’re okay with that, then that’s a great way to go. However, if you want to retain 100% ownership, getting a small business loan might be the path to take. Yes, you have to pay it back with interest, but once you’ve used that loan to build up your business and have it paid off, you still own your business outright. Take time to evaluate what’s most important to you before choosing a partner, investor, small business loan, or other route. Starting a small business is no easy feat, but when done right can be one of the most rewarding things you will ever do. If you dream of running your own business and being your own boss, what are you waiting for? Thanks for a great article. I’m not familiar with the term “bootstrap” in relation to funding a business. Can you explain further what that means? Great question! To bootstrap a business means you do all the heavy lifting and legwork of starting a business with very little capital. Some people choose this route because they don’t want to give up any equity in their company to investors. Results are often not seen as quickly, but the advantage is that you maintain total control of your company. If you want a little more information, here’s a breakdown of the term “ bootstrap” in business.